Donkeylicious: Wisconsin Senate: Baldwin > Kind > Feingold, Barrett? Wisconsin Senate: Baldwin > Kind > Feingold, Barrett? David Nir lays out the contenders in the race for the retiring Herb Kohl's Senate seat in Wisconsin. The two big contenders on the Democratic side seem to be Rep. Tammy Baldwin and former Senator Russ Feingold. There's also Rep. Ron Kind and Milwaukee Mayor Tom Barrett. Overall, it seems that Democrats have a pretty deep bench in the state. I'll present the initial impressions about the situation I've formed after doing some Googling. I don't have a great idea of how the various candidates stack up as far as their likelihood to win the general election is concerned. Feingold, obviously, won statewide elections three times, despite losing his most recent one by 5%. Baldwin represents the liberal district that includes Madison (PVI=D+15) and wins it by the large margins you'd expect. She got 69% of the vote there in 2008, the same as Obama, and won 62-38 even in 2010. Ron Kind might be the most electable candidate, as he outperformed Obama by 5% in his mildly Democratic district back in 2008. It's harder to evaluate Barrett, who lost the governors' race to Scott Walker 52-47 in the 2010 GOP wave, the same score by which Feingold lost his Senate seat. My guess is that electability considerations favor Ron Kind, and everybody else is bunched together. All in all, I'm pretty optimistic about Democratic chances in the state, especially with how mobilized Democrats are after all of Scott Walker's union-bashing, and with Obama at the top of the ticket. Who would I be happiest to have in the Senate? 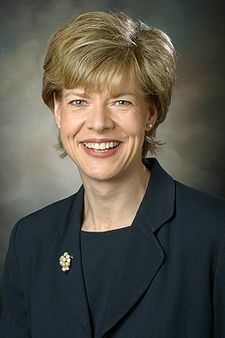 Tammy Baldwin. National Journal had her as the most progressive Democrat in the House in 2011. She'd also be the first openly homosexual Senator. While Russ Feingold is a hero to many progressives for being loudly on the right side of important issues, he's a fairly ineffective legislative tactician. I give a lot more points for actually moving policy outcomes leftward than I do for being eloquent and right in defense of a losing position. As far as I can tell, New Democrat Coalition member Ron Kind is more moderate than either of those two. And since Barrett hasn't been a federal legislator for a while, it's hard to tell how he stacks up. As a random guess I'd put him between Kind and the two solid progressives. Given that I'm optimistic about Wisconsin in 2012, I'd be inclined to take a risk and express a preference for Baldwin. But I can definitely understand if people who are willing to sacrifice some Senator quality for a greater likelihood of beating the Republican want Kind.